Please apply to serve as a volunteer judge. 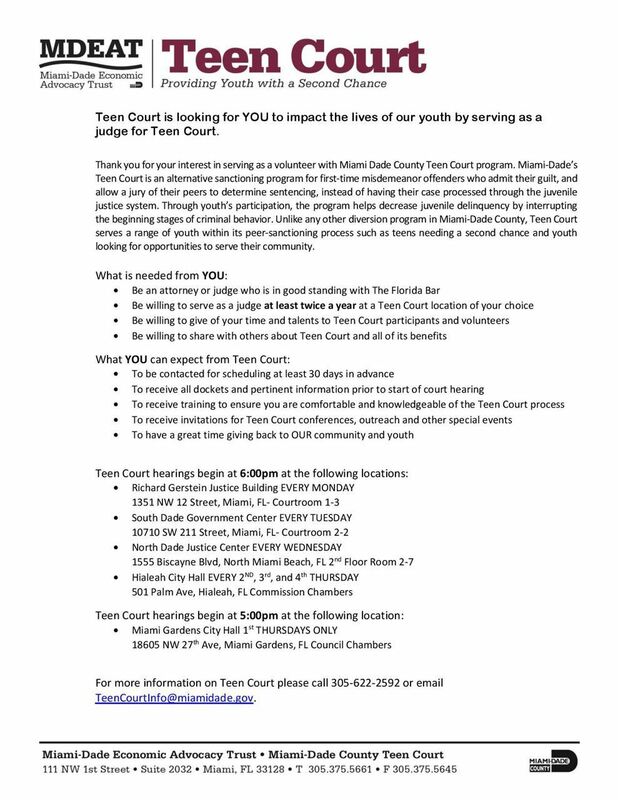 Additional information about Teen Court can be found here. The Legal Services of Greater Miami, Inc. has various pro bono opportunities below. If you are still busy getting ready for school or catching up from vacation perhaps you have a colleague that has the time to help out! Client is afraid that he will be in foreclosure if the mortgage history discrepancies are not resolved. He has called company several times and gets various conflicting explanations. Client previously battled company for almost 4 years before the matter was resolved in client's favor. He needs help battling this mortgage servicing company that is no stranger to bad practice! Veteran is caring for his deceased brother’s minor and disabled children. He needs legal assistance with probate process for car and bank account. Client is a vet on disability who is threatened with loss of his home from a master association maintenance cost never disclosed to him at closing, which closing documents support. The client has the money for the maintenance but does not want to pay late fees, attorney’s fees and costs. This is a Mission United veteran pro bono opportunity! Long time Overtown community member and educator is seeking legal representation to obtain 501 c 3 status for non-profit organization that will provide community service opportunities and educational programs to underprivileged youth, ages 14-20 years old. The case involves an individual who was living and working in Puerto Rico. She filed her PR returns. In 2015, the IRS issued a CP2000 because client did not report her PR income on her US return. She had to file a US return because she took a distribution from her 401(k) and also failed to report that event. In 2016, the IRS disallowed client’s Form 2555EZ saying that her foreign tax home was disallowed. The taxpayer really did live and work in PR. She paid rent and everything. Opa-Locka company trying to expand the business. Client seeks to recover possession of a solid waste disposal truck purchased using personal loans. Truck possession, title and registration was placed into another business entity controlled by client's relative in Central Florida, and business proceeds were intended to cover debt service. No security agreement or lien was ever placed on truck. Business has stopped making debt service payments. Clients looking to understand options to recover possession of truck and operate waste disposal business in Miami-Dade County. Legal needs include: advice and counsel on options to recover truck and assistance with perfecting security interest in truck, if possible, and recovering possession. Client lives alone. She suffers from severe diabetes and cognitive impairment. Her 43 year old son, who lived with her and supported her financially, was recently killed in a motorcycle accident. Her mother has helped her pay her mortgage, taxes, and insurance but now has stage 4 lung cancer. Client has $50,000 in credit card debt. She has multiple collection cases pending and anticipates more. Seeking an attorney to assist with debt collection regulation and potential Chap. 7 Bankruptcy. Petitioner seeks a divorce, child support, alimony and equitable distribution of assets (marital home and business). Petitioner explains that she worked as the assistant to the husband in his realtor business for nearly 20 years. Respondent recently indicated that he will be moving, or has moved, to Honduras and has failed to pay the mortgage for months or provided any support to Petitioner and children. Petitioner filed action in May 2018 and Respondent/Husband filed answer and counter-petition. Combat veteran is seeking your assistance to adopt his 4 step children. The veteran's wife (biological mother) was granted 100% legal and physical custody of the children, via a Virginia Court Order. The children, range in ages 12-16. They have not had contact with their biological father for over 6 years, despite family attempts to facilitate a relationship. The children have strongly expressed a desire to be adopted, going so far as to inquire about the time frame for them to be adopted. Client is seeking assistance in getting legal custody of her disabled great niece. Client’s sister had a court dependency shelter order from Broward County giving her custody. Client’s sister became sick, and moved in with client bringing the disabled great niece. Client’s sister died and left great niece in client’s care. It has been a year since Client’s sister died. Child’s biological mother has continued to receive the child’s disability benefits. Client is trying to get child into better educational programs and provide assistance but is unable to do so legally. Biological mother has abandoned child. Navy combat veteran is seeking your assistance with establishment of paternity in Miami Dade County. The mother is seeking full custody with no time sharing. She is not allowing the veteran to see his child. The veteran wants to be a father and be a part of his child's life. Case has been ordered to mediation. This pro bono opportunity is brought to you via the Mission United Project. Early voting is underway for the August 28th Primary. Be informed, be ready, vote! On August 6th, GSCBWLA hosted its biennial judicial forum at New Birth Baptist Church, co-sponsored by the League of Women Voters of Miami-Dade County, the Dade County Alumnae Chapter of Delta Sigma Theta Sorority, Inc., ACLU of Florida, the Miami Chapter of Jack & Jill of America, Inc., and the National Action Network - Miami-Dade Chapter. With over 100 people in attendance, the judicial candidates made their cases for why they were best qualified for the bench, answering several questions posed by Moderator Chris Norwood. To learn more about the candidates, take a look at the 2018 GSCBWLA Judicial Candidate Forum Booklet. Please be sure to reach out to our members if you have questions about the various races. Judges play such a critical role in our system; as many of us serve as a resource for others, please be sure to have all the information you need before stepping into the ballot box. Aug. 13th through Aug. 26th. You can find directions to each of them at pbcelections.org. 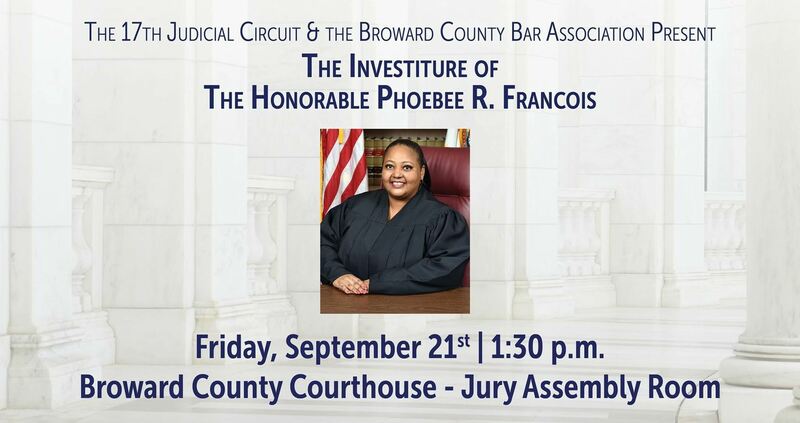 Sample Ballot: Please click here for Broward's sample ballot. Early Voting: Begins August 18th from 10 a.m. to 6 p.m. every day through Aug. 26th. You can find the voting sites here. Sample Ballot: Please click here for Miami-Dade’s sample ballot. Early Voting: The sites are open from Aug. 13th through Aug. 26th at various times. You can find the times and locations here. Radical Partners is now accepting applications for our 5th cohort of Social Entrepreneurship Bootcamp. This is our flagship 12-week leadership development program that helps local leaders accelerate the impact of their ventures with a focus on scale and sustainability. The program kicks off in September in Miami, and participation is entirely free thanks to support from American Express and a team of local female investors. Applications are now officially open! Please send in your nomination form by September 11, 2018. If you have any questions, please contact, Nestor A. Rodriguez, MCCJ Executive Director. MIAMI – The Eleventh Circuit Judicial Nominating Commission has been asked to provide Governor Rick Scott with nominees for the vacancy in the Miami-Dade County Court created by the resignation of County Court Judge Wendell M. Graham. The Commission requests that interested candidates submit an application for consideration. Applicants must meet the qualifications for county court judges described in Article V, Section 8 of the Florida Constitution and Section 34.021 of the Florida Statutes. In addition to the original application, applicants must e-mail a PDF version of the application to eleventhcircuitjnc@klgates.com with personal information not subject to public disclosure—such as the social security number—redacted as permitted by Section 119.071 of the Florida Statutes. Applicants are invited to provide the Chair with a one-page sheet listing the date, location and time of hearings or trials that they would want the Commissioners to observe. The one-page disclosure sheet is not mandatory and can be provided to the Chair at any time before the interview day. No information other than the date, location and time should be provided on the one-page sheet. Applications may be downloaded from the Florida Bar’s website at www.flabar.org and the Office of the Governor at www.flgov.com. Applicants should include a recent photograph. NOTE TO APPLICANTS: To assist the Judicial Nominating Commission in its review of applications, all questions must be fully and completely answered. Applications must include current contact information, including e-mail addresses, for judges, co-counsel, opposing counsel, and references to facilitate the background investigation that will be conducted by the members of the Commission. All applicants for the pending County Court vacancies resulting from the elevation of County Court Judges Dawn V. Denaro, Andrea Ricker Wolfson, and Renatha Francis will be considered for this vacancy without the need to re-apply. LSGMI's Pro Bono Opportunities: "Do good feel good!" The Legal Services of Greater Miami, Inc. has various pro bono opportunities below. If you are interested please contact, Jayme M. Cassidy, Esq., Pro Bono Advocacy Director for the Legal Services of Greater Miami, Inc.
An accounting and financial consulting company in the minority based community of Cutler-Bay desires to specialize in providing account and financial support to restaurants. Client seeks legal counsel on corporate governance and a service contract for customers. Legal needs include: 1) Drafting of a Single Member LLC Operating Agreement; 2) Drafting of a Service Contract; 3) Advice/counsel on the application process and potential closing of an SBA loan. Aspiring business owner needs Trademark counsel and assistance. Client is a low income female business owner seeks to open a fitness studio for mothers with children aged 0-5 years old. The exercise equipment and space is specifically designed to allow mothers to have children in safe, close proximity during the mother's exercise. The studio space is already secured, and client would like to file a service mark for Brand Name and Logo. Cursory check of USPTO database shows that no registration has been granted for similar name. Opa-Locka company trying to expand business. Client seeks to recover possession of a solid waste disposal truck purchased using personal loans. Truck possession, title and registration was placed into another business entity controlled by client's relative in Central Florida, and business proceeds were intended to cover debt service. No security agreement or lien was ever placed on truck. Business has stopped making debt service payments. Clients looking to understand options to recover possession of truck and operate waste disposal business in Miami-Dade County. Legal needs include: advice and counsel on options to recover truck and assistance with perfecting security interest in truck, if possible, and recovering possession. Longtime friends and 22 years of marriage, client nurses husband through multiple illnesses. Client hasn’t worked in past few years. She opted for early retirement. She will be 65 in December and her SSD will be reduced to pay for her Medicaid. Husband left her stuck with all the bills and debt. She seeks DOM and alimony. Spanish speaking. The monthly rent is $700.00 for Client's 2 bedroom apartment that she shares with her boyfriend and 4 dogs. Client has lived in the unit for the past 3 years. Client last paid rent in March 2018 due to the conditions of the unit, which include mold, leaks, non working toilets, and a rodent infestation. Client called FL Building Code and an inspection was conducted. The inspector found there to be a violation and required Landlord to repair the plumbing system by July 20, 2018. Landlord filed an eviction complaint against CL seeking $2560 in unpaid rent through June 2018. Client was served with the eviction summons and complaint on July 11, 2018. They have not yet filed an answer or motion to determine rent. They have been advised to do so. Client has been using some of the rent to pay for storage. Client, wife, and their 5 year old son are renting a 3 B unit since March 2017. Rent is $1,539.00 with year lease agreement. Client failed to pay rent full for June. He and his wife work as professional massage therapists, but since they don't get paid by the hour, sometimes they run short on the rent. When client came to our office, Client only had $ 600.00 towards June's rent and does not have July's. LL alleges 1,735.97, total include full rent for June and $ 43.09 balance for May. Cl states he paid all the rent for May. Client filed a Motion to Determine Rent which is really a motion for extension of time. As a result of the resignation of Circuit Judge John Contini, the Seventeenth Judicial Circuit Judicial Nominating Commission is accepting applications for one vacancy on the Broward Circuit Court. Applications received after the deadline will not be considered. All applicants must have been members of The Florida Bar for at least five years, electors of the state of Florida and residents of the Seventeenth Circuit before taking office. One original application, typed and bound securely. One separate redacted copy of the application excluding all exempt information under Chapter 119, Florida Statutes, or other applicable public records law, typed and bound securely. An electronic copy of both the original application and the redacted application, saved in PDF format, each on a separate, password-secured flash drive, with the applicant’s name clearly indicated on the exterior of the flash drives. Each PDF must be a single file not to exceed 8 MB. The applicant shall provide the password(s) for the flash drives on a separate piece of paper and shall not write the password on the exterior of the flash drives. No other attachments or files are to be included on the flash drives. All letters of recommendation that the applicant wishes the commission to consider. The letters shall be included as attachments to the original application and the redacted copy, and shall be included with the applications saved on the flash drives. The financial disclosure information requested in the application, inclusive of a completed Form 6 (Full and Public Disclosure of Financial Interest), must be submitted with the original application, the redacted application and the electronic copies of each. A recent photograph of the applicant shall be attached to the application and redacted application, and included as an attachment to the applications saved to the flash drives. Any additional information that the applicant feels may be helpful to the commission in assessing the applicant’s qualifications. The information shall be included as attachments to the application and redacted application, and shall be included with the copies of each saved to the flash drives. Applicants are asked to strictly follow all requests and instructions in this notice. Failure to do so could result in an application not being considered. The commission strongly suggests that applications be submitted as soon as they are prepared and well before the deadline. Applicant interviews will be scheduled in the order in which applications are received. After the deadline for submitting applications, the commission will determine which applicants will be interviewed. Applicants selected will be contacted to confirm the date, time and location of the interviews. All proceedings of the commission are open to the public, except for deliberations. Accordingly, applicants should not expect applications and/or information to be kept confidential, subject to applicable Florida Statutes. If an applicant is nominated, all materials attached to the original application will be submitted to the Governor’s Office, which may request additional copies of same. 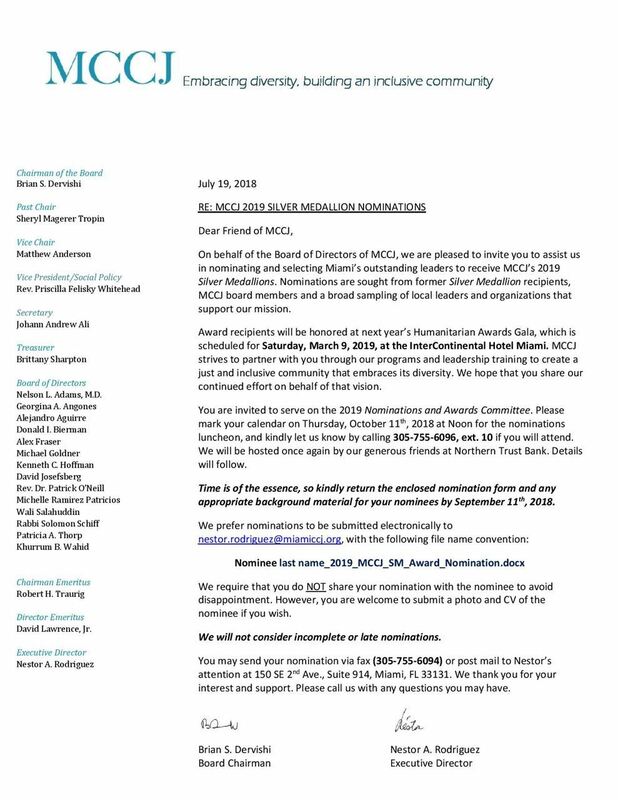 If there is any question about the application process, please contact the Chair of the JNC, William G. McCormick, or his assistant, Gale Myerowitz at 954-761-8111. MIAMI – The Eleventh Circuit Judicial Nominating Commission has been asked to provide Gov. Rick Scott with nominees for the vacancy in the Miami-Dade Circuit Court created by the resignation of Circuit Court Judge Stephen T. Millan. The Commission requests that interested candidates submit an application for consideration. Applicants must meet the qualifications for circuit court judges described in Article V, Section 8 of the Florida Constitution. In addition to the original application, applicants must e-mail a PDF version of the application to Hans Ottinot, Esq., Chair (hottinot@sibfl.net ) with personal information not subject to public disclosure—such as the social security number—redacted as permitted by Section 119.071 of the Florida Statutes.